The TC Electronic Fangs Metal Distortion is a fierce choice for metal fanatics and is your new go-to device for creating heavy distortion tones for a very affordable price. 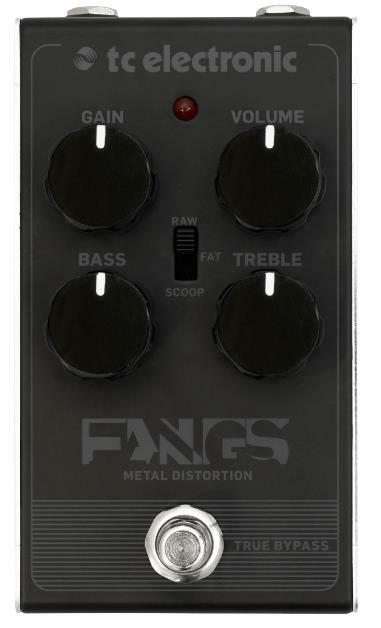 The Fangs Metal Distortion has three mid-frequency settings (Raw, Fat and Scoop) to shape your metal onslaught with immediate access to ferocious thrash, groove and nu-metal tones. Alongside this, it has four rugged-design control knobs comprised of Gain, Volume, Bass and Treble for easy foot control during live performances. This pedal is housed in a durable metal chassis to protect components from internal damage and general wear and tear. A compact design with top mounted jacks also maximises pedalboard space, ensuring you can unleash your inner metal beast without compromising the rest of your setup.